Wow what an amazing week ahead for all of us!!! This week is all about change and order. Is there a path that you have been wanting to go down, but lacked the courage. Have you wondered when is it going to me “MY TIME”? Well it is clear that the time is now. The cards are showing me that you are being given an opportunity to stretch your wings and see if you can fly. In the beginning of the week you will have a chance meeting with an Indigo. Or maybe you know this person already, or it could be that this person is you and you have finally decided what you truly want in your life. It maybe a little difficult at first, but you have Angels and the Goddess Nu Kua to guide you and find order. It is a time of prayer and reflection. Take stock in your life and find what you want and don’t want in your life. Be honest with yourself! Let that small voice guide you. Start to cleanse the aspects of your life that no longer serve you. In the middle of the week. You will be clearer on what you want and begin to take action steps. The things that you feared to ask for will come to the surface. You will not only ask for what you truly want… but you will get it! It could be a job, a raise, or a relocation. The change will be provided for by the Universe and life is going to get a lot easier as you allow the flow of change guide you to your next step. The weekend is here and all the pieces are starting to come together for you as you start to see the bigger picture. You are a powerful and confident. You are a living breathing Lightworker and you now see the best ways to not only your path, but to service. This service is all about your passion that you have always carried with you. It is the thing or things that have always given you the biggest satisfactions in your life. You will know it when you see it!!!! And it’s all good!!! To start (The Bottom Card) is our guidance card for the week. The card pulled is the Goddess Nu Kua. She is the Goddess of Order. Nu Kua is a Chinese Goddess it is pronounced (Noo’ kwah) Nu Kua is the dragon-bodied Goddess. She is called upon when the Universe needs to have order restored. So order is coming into your Universe as well. She is here to help you create order out of chaos. Do you find that you are excellent at organizing everyone but yourself? Or perhaps you have created order but now it seems a bit stifling and still. Now is the time to nurture yourself with order that assists rather than chokes your life force. Nu Kua says that when life is ordered in the natural way your nurture your path to wholeness. When you forcibly impose something unnatural from without, you create rebellion and resistance. Remember that it must be a natural state for everyone! Let Nu Kua guide you with order and focus thru your week. The Card pulled is Indigo. The person you’re inquiring about is an Indigo meaning a highly sensitive natural-born leader. Indigo’s are overseen by Archangel Metatron. When the Indigo card is pulled it usually means that you are an Indigo or you are the parent of an Indigo. Indigos are high spirited and sometimes diagnosed with ADHD. They are misunderstood, but possess many spiritual gifts and have important missions. Maybe you are being asked by Metatron to help an Indigo child or adult in finding order and guiding their way. In doing this you are helping us all. Indigos are special and have a powerful path to follow. They are the activists of tomorrow. Help them in doing so you will help yourself. They have a powerful message for you as well. The card pulled is Archangel Michael. WOW!!! 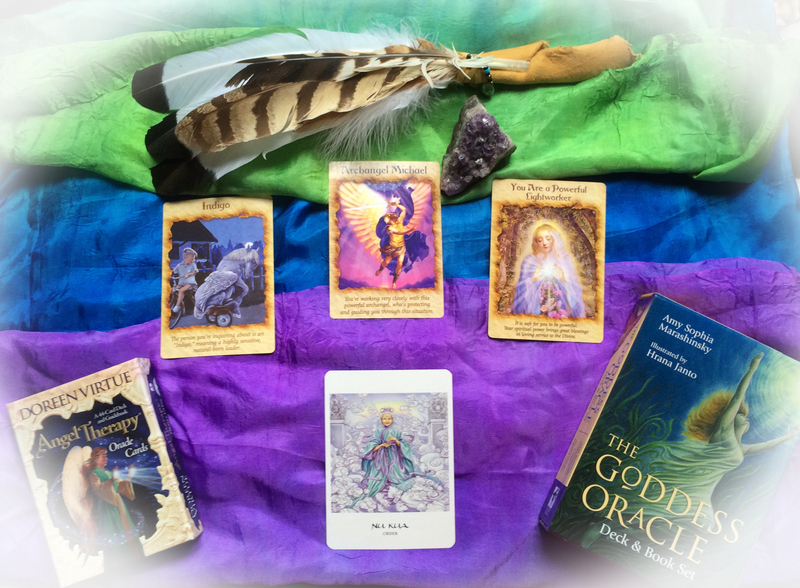 Know that you’re working very closely with this powerful Archangel, who’s protecting and guiding you through this situation. This card is proof of the validation of what you’ve already known or suspected. Remember that Archangel Michael is with you now. You can now through your week knowing that He is here to eradicate the effects of fear and He is here to protect you with his sword and shield. Let his courage and backbone help assist you in the face of your fear and help you to take intimidating action. If you’ve been considering making a life change, such as moving or taking a new job let Michael assist you. Michael is also the in helping you find what your life path is. Pray and be silent and allow Michael to enlighten you to #1 find the courage to ask the question…What is my next move in my life’s purpose? What can I do today to start the process? Remember that you are being protected and Divinely guided. You are safe! The card pulled is You Are a Powerful Lightworker. It is safe for you to be powerful. Your spiritual power brings great blessings in loving service to the Divine. This card has come forth to remind you that the angels want you to feel comfortable with your spiritual power. You are extremely powerful. Remember that you are made in the image of the Divine and that the Divine power flows through you when you hold an intention. It is safe for you to feel and channel this power, as it is not personal or ego-driven…it is of spirit. When you hold an intention to use Divine power in the service of love you experience harmony in all your activities. The more comfortable you are with your spiritual power, the more steadily and evenly it flows through you. Meditate and listen to your spirit. Allow the Divine flow of inspiration come to you naturally. This flow is an answer to a prayer.